Simon Moores, managing director at Benchmark Mineral Intelligence, shares his thoughts on the lithium market, solid state batteries, prices and more. 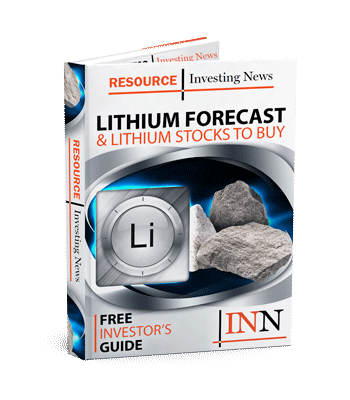 At this year’s Lithium Supply and Markets conference in Las Vegas, the Investing News Network had the chance to catch up with Simon Moores, managing director at Benchmark Mineral Intelligence, who shared his insight on the lithium market. Speaking about current challenges in the lithium sector, Moores said bringing new supply into the market is difficult. “I think that’s quite well-known now, but it’s not straightforward, it’s not just about getting the spodumene up and running, it’s about that conversion capacity and what’s actually real,” he said. In terms of opportunities, Moores mentioned that this year automakers and OEMs started to get serious about lithium. “I think now we are coming into a new era where the auto companies know that someone is going to have to pay for the supply chain to scale and most are trying to work that out,” Moores added. Moores also shared his thoughts on solid-state batteries, saying that the cost of lithium metal is the biggest issue at present. “Lithium metal sells for about $150,000 a tonne right now, so you can see the challenge for these battery makers if they want to scale, but I actually think building that supply chain, we’re at least five years away from lithium metal having to significantly scale for battery production,” he added. Listen to the interview above or read the transcript below for more insight from Moores, including his thoughts on what’s next for lithium-ion batteries, lithium prices and factors to watch. You can also click here to listen to our full Lithium Supply and Markets interviews playlist on YouTube. INN: We’re entering the second half of the year, in your opinion, what have been some of the challenges and opportunities in the lithium sector? Simon Moores: I think challenges are well-known from bringing new supply into market. I think that’s quite well-known now, but it’s not straightforward, it’s not just about getting the spodumene up and running, it’s about that conversion capacity and what’s actually real –so that’s the biggest challenge for me that the lithium industry faces and it’s not gonna change for the next two years. But really, I’d say the opportunities and trends that have caught my eye definitely would be the auto, OEMs getting serious about lithium, they’ve been talking to a lot of people for– for some time and getting their education up to scratch and I think now we are coming into a new era where the auto companies know that you have to –well, someone’s have to going to pay for the supply chain to scale and most are trying to work that out, they know that now, I think, they have to have some kind of input somewhere, but that’s the raw material or the cathode or the batteries. We think it’s going to lie with the raw materials, the two key ones, which are lithium and cobalt in our eyes and I think that’s the biggest opportunity that the lithium space faces right now. INN: The last time we spoke, we talked about solid-state batteries and it seems everyone is looking at this type of technology as a potential replacement for lithium-ion batteries, how advanced is the researcher for this type of technology and what are the main benefits compared to the current lithium-ion batteries. SD: The way I view solid-state is it’s still in a heavy research and development (R&D) phase, but it’s in a commercial R&D phase. The way I view any battery technologies is kind of in four sections. One is the invention of the battery and say, that resides in universities, then you have the R&D commercialization of that battery, which is where solid-state is right now, and the third stage I see is true commercialization, when batteries are being used in the real world in a significant number and the fourth phase is wide-scale usage in things like electric cars. With solid state, I don’t see a solid-state battery being used in an electric car anytime in the next five years. This is a true solid-state battery that I’m talking about. In terms of a potential replacement for lithium-ion batteries, it’s a long way off and it’s quite specialist, I mean, the principle behind solid state is that you use a lithium metal anode and not graphite as a solid polymer in there and you get 70 percent improvement on the lithium-ion battery at the cell level. The problem is the lithium metal that’s probably, at present, the biggest blocker for the cost of lithium metal and the production, biggest blocker for the next stage of solid-state, the commercialization. INN: Is the lithium market prepared to supply the raw material that is needed for these type of batteries? SD: Yes, I think the lithium market is looking at lithium metal for solid state is actually there’s been a decent amount of expansions in lithium metal in recent years Ganfeng Lithium (SHE:002460) is the one that’s done the biggest expansion to 100,000 tonnes but you know you’re looking at a market that’s 3,000 tonnes a year of lithium metal, which equates to about 15,000 tonnes lithium carbonate equivalent (LCE) so it’s tiny compared to the other markets and chemicals for lithium. To scale that is going to take, is actually not going to be too much of an issue, the cost of production is what is going to be the biggest issue. Lithium metal sells for about $150,000 a tonne right now, so you can see the challenge for these battery makers if they want to scale, but I actually think building that supply chain what –we’re at least five years away from lithium metal having to scale for battery, significantly scale for battery production. INN: How long does it take for a shifting technology of this scale to take place? Even if it’s not solid state batteries and is it worth having this conversation now? Will we see it changing cathodes to higher nickel be adopted first before switching to solid state or other advanced technologies and do you expect cathode chemistry to remain the same? SD: It’s a good question. For me, the shift in these technologies takes a long time. Even if it works and it’s proven to work in a vehicle, it’s still going to take a good amount of time. I’m talking tens of years here rather than single digit years and saying that I could see a situation where solid state becomes a specialist battery technology for high-end vehicles and lithium-ion is actually used in the majority of mid-range EVs, but again you’re at least five years off solid-state batteries being used in any form of mainstream vehicles and that’s something significant in changes and shifts right now. There’s still too much R&D to do in this space and I think that’s gonna –solid-state batteries will be used in much more applications up until that point such as drones and mobile phones and things like this and that will give some real-world feedback to the industry that doesn’t really have that yet. On the high nickel cathode, the shift to 811, which everyone is talking about, we think it’s actually going to happen a bit slower than what people are thinking and we anticipate really an uptake in probably 2020 onwards as starting to have a material impact in the market and the use of 811 in solid state batteries also is possible because they’re using well they can use the same cathodes, so solid-state batteries we talk to and the majority using NMC and it can easily be NMC 811 or any high-nickel formulation that is something actually that would be sold by the time these companies start making batteries for EVs. INN: Another big topic right now is prices. What is in your opinion one of the biggest misunderstandings or myths regarding pricing? SD: The biggest myth surrounding pricing is “what is the lithium price?” because there is no one lithium price, which the newcomers want one lithium price, but the existing market have a wide range of lithium chemicals and then grades within a specification so you could have, well a benchmark we do, monthly lithium prices assessments where the lithium industry’s reference price and we do six lithium carbonate prices, four lithium hydroxide and one lithium feedstock price. It shows you why we collect prices by speaking to the lithium supply side, by speaking to a wide range of consumers that are doing their own internal analysis each month to create a range and it just shows you how fragmented and diverse the –the lithium market is and that’s very difficult for newcomers to understand it not dealing with a commodity here we are getting this specialty chemical. That being said, it will be interesting to see how the market evolves when you have companies likely or exchanges like the LME looking to list lithium and how it will impact the market and is something that you know we’re very interested to find out and –and pricing is still opaque despite the work we’ve done at Benchmark it’s still opaque and that’s why the supply chain relies on us to provide that clarity. INN: My last question for you today, what would you say is one of the factors that is most overlooked by investors? Is there anything you think investors should be paying attention to right now that could impact the market going forward? SD: Investors I think struggle to understand, and for good reason, they struggle to understand the lithium chemical conversion is part of the equation. It’s easy to look at the mining, that’s quite transparent, they are from the brine and spodumene aside, but really what is the determining factor for the industry right now is how much conversion capacity really is in China. So, we spend all our time in China building our own an internal view on this. That view is the –we’re about 640 thousand tonnes of capacity listed. Now, listed in nameplate does not mean that’s actually there and that’s a key thing really for us the real capacity number within China right now this year is about 220,000 tonnes, so investors would read 650,000 tonnes that would mean lithium oversupply, “we knew it, let’s –let’s get out of the industry.” The reality is that real number is about 220 and then that’s operating at capacity. So, the capacity is probably, we could probably half that again to get the amount of production that we would want to see, then all of that production in China is not necessarily quality to go into batteries. So, that’s another hurdle that the industry has to go over and so, the further you go down the supply chain, the harder it is to –to make the right kind of products for the industry. And that will naturally restrict supply. I think that is the key thing for investors to understand.